From the 16th to the 21st century, three ‘King-Whisperers’ infiltrated in the institutions of government and changed the course of history. Winston Churchill with his scientific advisor Lord Cherwell (furthest to the left), Air Chief Marshal Sir Charles Portal and Admiral of the Fleet Sir Dudley Pound, watching a display of anti-aircraft gunnery, June 1941. Photograph owned by the Imperial War Museum. An éminence grise is a French expression meaning a shadow counsellor — a key influencer who acts with discretion and little personal accountability. History is full of examples of these éminences, yet considering the impact they have had and the millions of lives they have affected, they are rarely given the attention they deserve. They are silent revolutions incarnate. It is hard to believe that a single capuchin monk might have prolonged the Thirty Years’ War — in which more than eight million Europeans perished — to satisfy his mystical convictions. Or that a princess few have heard of is responsible for providing stability to France after the revolution. And what about the German scientist who convinced Churchill to commit what are, in today’s terms, atrocious war crimes? Their stories read more like historical novellas while providing insight into how power really works. The term éminence grise is at its origin a reference to an unassuming capuchin monk who lived in 16th and 17th century France. ‘Grey’ is a reference to the rough grey cloth of his monastic order, and ‘eminence’, a title usually reserved for Cardinals, an allusion to his power as well as to the man he would advise — the Cardinal de Richelieu, effective Prime Minister of France. 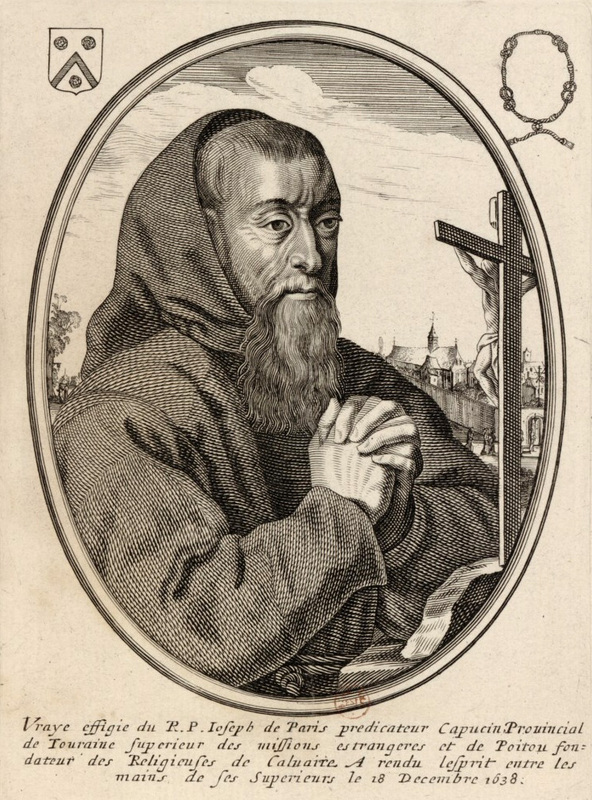 The monk’s name was François Leclerc du Tremblay, but he is better known as simply Père Joseph. Père Joseph was born in 1577 in France, during one of the greatest periods of religious violence in Europe. The French Wars of Religion pitted the Catholics and Huguenots against one another. One of the most notable events during this conflict was the Saint Bartholomew’s Day massacre, when a bloodthirsty mob ran through the streets of Paris butchering Huguenots, congealing the Protestant vision of Catholics as treacherous and underhanded. The French state was weakened to the brink of collapse, but was rescued by the Edict of Nantes, which granted protections and (limited) rights to Protestants. Père Joseph was born five years after this massacre, and would grow to be remarkably devout. Ever since childhood he had been struck by the suffering of the crucified Jesus and the weeping Virgin on the Calvary. He would often enter trance-like states as if carried to Golgotha. He learned a form of prayer known as self-abnegation — a meditative reflection focusing on the absolute destruction of individual will — so that he could become a vessel for the will of God. By today’s standards, he might be considered a fanatic. When the Edict of Nantes was signed, Leclerc had already become Père Joseph. He had joined the Capuchin order, known for its discipline and self-imposed austerity. After finishing his religious instruction in Rouen, a chance encounter would have him meet none other than the King’s Aunt, the Abbess of Fontrevault. Try as he may, under his tattered habit he retained the habitus of a nobleman. The encounter would leave the Abbess so impressed by Père Joseph’s intelligence and manners that she enlisted his help to reform her Abbey. The nuns at Fontrevault were recruited from the highest echelons of the nobility, and were less than diligent in observing their vows of poverty. Preaching in protestant cities in the aftermath of a religious war was a breeze compared to reforming an order of gilded nuns. Père Joseph turned to the nearby city of Luçon for help from a young Bishop who was gaining a reputation for his reforming ability. What would have been an innocuous meeting between two pious men was in fact the first meeting between the éminence grise and Armand Jean du Plessis, the future Cardinal de Richelieu, known as the éminence rouge. The two found themselves in agreement on key issues. For them, Huguenot power was a threat to the unity of the state. What’s more, the Wars of Religion meant that military power had slipped into the hands of magnates and away from the crown. Finally, their Habsburg rivals pressed their advantage in Europe at the expense of France. They were both convinced that national unity under an absolute monarch would remedy all the ills from which the country suffered. The relationship between these two clerics would become powerful and symbiotic. Richelieu sought power and wealth, but was often plagued by self-doubt. The austere Père Joseph was motivated by burning visions of a strong and powerful France taking its rightful place as the divinely ordained leader of Europe. The Capuchin’s strength of purpose supported the Cardinal’s political ambition. Together, they imposed Catholic dominance in Béarn and broke the power of regional aristocrats. They starved the Huguenot city of La Rochelle into submission after a long siege and at a cost of 20,000 lives. But their greatest project took place during the Thirty Years’ War (1618-1648). The war began as a conflict between Catholic and Protestant states in the Holy Roman Empire, but quickly disintegrated into one of the most devastating periods of violence in human history. When the conflict broke out, the saintly Capuchin showed his aptitude for realpolitik. He advised Richelieu to support the Protestant powers fighting the Catholic Habsburgs. This would weaken France’s main rivals in Europe, while giving them the time to mobilize a proper army and become the dominating power of the continent. In a way, Père Joseph was successful. Thanks to his strategy, France was finally strong enough to claim a string of victories near the end of the conflict at the expense of the Habsburgs. Internally, France carried on the project of unification and perfected the model of absolutist monarchy under Louis XIV. But above all, history has been kind to Père Joseph. Few remember the monk who sacrificed millions on the altar of his own mystical fanaticism. Qu’un démon soit près d’un ange? Père Joseph helped establish the foundations of what the French State would be for years to come. But the rigid absolutism he admired for its stability could not withstand the economic and social forces that led to the French Revolution. At the end of the 18th century, France went through a deeply troubled period. The monarchy was overthrown, the king beheaded, and a republic put in place, only to be swept aside by Napoleon’s empire, which in turn fell in 1814. The European powers that defeated Napoleon restored the Bourbon Monarchy, which in turn was supplanted by the House of Orléans in 1830. True to the discrete nature of an éminence grise, the key supporter that saw the Orléans king Louis-Philippe ascend to the throne is rarely mentioned. Yet if there was a king from the House of Orléans at all, it was thanks to Louis-Philippe’s sister, Adelaïde. Adelaïde d’Orléans was born in 1777, under the ancien régime. The Orléans were so instilled with the spirit of the Enlightenment and democratic principles that they supported the revolution and a constitutional monarchy. When the radical Montagnard faction began to take power in the early 1790’s, her father chose to send Adelaïde abroad for safety — a wise decision, as he would himself perish under the Reign of Terror only months later. This marked the beginning of a long and tumultuous exile for Adelaïde d’Orléans which saw her playing cat and mouse across Europe as hostile powers rose and fell. She was finally reunited with her brother in 1809. By 1814, Napoleon’s Empire had fallen, and the Bourbon cousins of Adelaïde d’Orléans reclaimed their hereditary throne. She, along with her brother and sister-in-law settled in their apartments at the Palais-Royal in Paris. 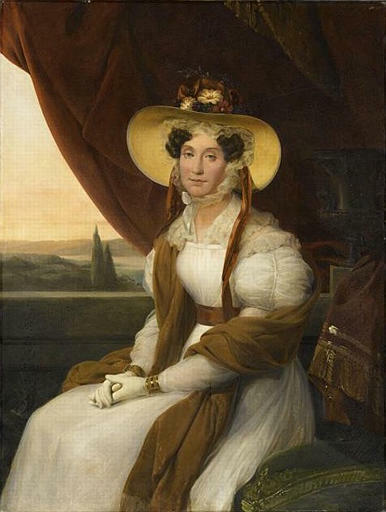 Portrait of Louise Adélaïde d'Orléans, by Marie-Amélie Cogniet, based on a portrait by Auguste de Creuse (1838) in the Musée Condé. Adelaïde d’Orléans was admired for her intellect and political ability. She led key discussions in the Orléans family council and acted as counsellor and confidante to her brother who was now head of the Orléans clan. She helped disseminate liberal ideas dear to her and her family. She was also responsible for achieving a surreal exploit: hosting a Salon that welcomed opponents of her royal cousins, making her the effective head of the opposition in France. Slowly but surely, she cultivated a resistance to the conservative King Charles X. When the latter overstepped his bounds by trying to undermine parliament, the time had come for her to leverage the political capital she had acquired for her brother. Riots broke out in Paris for three days in July 1830, forcing the King to abdicate and take to exile. When representatives from the Thiers government were sent to offer the crown to Louis-Philippe, he had already fled the capital. Only his wife and sister remained. It was on this occasion that, contradicting her sister-in-law, Adelaide d’Orléans accepted the crown on behalf of her brother. The July Monarchy, as her brother’s rule has come to be known, was marked by several features. Louis-Philippe was known as a liberal. He took the title of “King of the French” rather than “King of France”, to illustrate that his was not a monarchy based on a divine right but a pact with the people. He modernized and led the industrialization of France which until then had been a rural country with an agricultural economy. In reality, many of these accomplishments are to be credited to the zeal and foresight of his sister. Adelaïde d’Orléans was also one of the key architects behind the rapprochement with the British, thereby breaking the block of allied European powers that defeated Napoleon. Perhaps the most important contribution she made to her brother’s rule was her intelligence and her encouragement, providing Louis-Philippe with daily advice on matters of state, and offering the regime an internal stability that had been missing for so long. It speaks volumes that her brother was only deposed in 1848, after Adelaïde’s death, with many historians drawing a link between the two events. The ability and influence of this remarkable woman helped a poor and rural country, ravaged by war and revolution, to transform itself into an industrialized modern state. Granted, as with most influential counsellors, the full extent of Adelaïde’s sway over her brother is difficult to measure. But that Louis-Philippe crumbled when left to rule alone is a testament to the ability of Adelaïde d’Orléans to shoulder the burden of leadership. This burden can be remarkably heavy, and to seek out a confidant becomes a natural response, particularly in times of war. Such was the case with Churchill and his dear companion, Viscount Cherwell. History has shown its ability for amnesia towards Churchill, whose actions led to the death of millions in Bengal during the 1943 famine. History again showed itself forgiving when Churchill pushed the Americans into an operation to overthrow Mohammad Mossadegh in Iran. But the magnanimity of history to Churchill’s legacy, at least in Europe, is especially striking when considering the allied bombing of Germany. Despite the deification of Churchill as the liberator of Europe (a feat made possible in great deal due to his personal leadership), he was nonetheless a man who bore an exceptional burden. His schedule included long days filled with meetings, working into the small hours of the morning with nothing but the company of scotch and soda, and collapsing in his bed before starting the interminable routine once again. And so, Cherwell enters the story as Churchill’s faithful companion. Born in 1886 in Baden-Baden as Frederick Lindemann, he was wealthy, ferociously intelligent, and talented in several fields outside of his profession as an Oxford physics professor. He was a remarkable tennis player and competed in Wimbledon. He was an avid pianist, and an excellent pilot. He developed a method of aircraft spin recovery that he demonstrated himself with trademark bravado by taking up a plane, entering a spin, and surviving to tell the tale. If Ingres had a violin, Cherwell had at least a string quartet. Cherwell nonetheless remained a deeply arrogant man, unpleasant to all except a fortunate few, as well as virulently racist, snobbish and utterly disagreeable. Born with all the advantages of success, his obsession became his one handicap in early twentieth century Britain: his German heritage. Perhaps his advocacy of the area bombing of Germany and civilian targets is due to a desire to rid himself of this stain. Whatever the cause, his advice to, and influence over, Churchill led to untold death and destruction with little to show for it. Known informally as “Prof”, Lindemann met Churchill at a dinner party at Blenheim Palace. The two shared a passion for reinvigorating the RAF, and by 1940, Lindemann was made scientific advisor with regular access to the prime minister. By 1941, he was raised to the peerage by his dear friend and given the title of Viscount Cherwell. It is in his capacity as scientific advisor that Cherwell advocated for the area bombing of Germany. In 1942, he met a physiologist named Solly Zuckerman at High Table dinner at Christ Church College, Oxford. Zuckerman worked at the Ministry of Home Security, and together they conceived of a way to sway the debate on the area bombing of Germany. They would collect data on the impact of the German bombing campaign during the Battle of Britain, and extrapolate this back to Germany. By March 30th, Cherwell had drafted his infamous memo for Churchill. In what reads more like a consultant’s case study, Cherwell describes with cold indifference the physical and psychological damage expected per tonne of bombs dropped on civilian targets. His intentions were to inflict as much damage as possible on Germany. He believed precision bombing was a waste of time and resources, and that destroying cities would cripple the German economy and morale. Despite facing opposition, including from Zuckerman himself who found his analysis distorted and misrepresented, this memo enraptured the mind of the Prime Minister, and the promise of results won out in the end. 583,000 people in Germany were to lose their lives as a result, either buried under their houses or engulfed by flames. Whether their deaths are justified is a debate that rages on among historians today, but strong evidence supports the view that area bombing was inefficient in terms of results. These three historical examples illustrate a truth that is often forgotten: power and influence are rarely a public affair, nor are they necessarily rational. This is a reality that is rarely fully appreciated. A common practice in foreign offices and consultancies today is creating influence maps to visualize precisely this reality. Public and private institutions have learned that the task at hand should be to identify the éminence grise in a network. Unfortunately, this appreciation for the importance of influence is not the same in the public understanding of how power works, and those who influence major decisions often become footnotes of history. Whether it be a religious fanatic whispering in the ears of a Cardinal, a loyal sibling advising her beloved brother, or a scientist recommending military tactics to a prime minister, an éminence grise influences, but isn’t seen and rarely held accountable. As long as political power is exerted, the grey eminence will always be the politician’s shadow. It is up to us to make sure that their names — Père Joseph, Adelaïde d’Orélans, and Viscount Cherwell — are not forgotten.